I've been trying out some very affordable beauty stuff recently & here are some quick reviews, photos & swatches. * This post contains some press samples. St. Ives Fresh Hydration Lotion Spray in Citrus & Vitamin C ($7; drugstore.com) - St. Ives' newest launch is their lightweight lotion in a convenient spray form. Its a light, fast absorbing lotion for normal skin. For this weather though, my skin did feel a tad dry after a few hours. The scent is amazing - very zesty, fresh and it lingers around for a while. I do think its a nice lotion for the summer and a fabulous pick for the price! 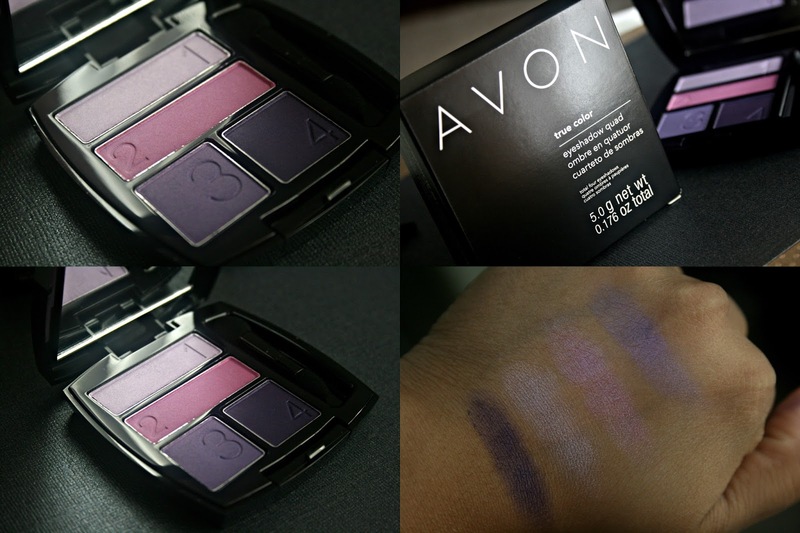 AVON True Color Eye Shadow Quad in Purple Pop ($7; avon.com) - AVON has recently re-formulated their True Color Eye Shadow quads and I must say they're nicely done. Purple Pop is quite pigmented, smooth and very easy to blend. I've tried some of the older quads by AVON and the pigmentation was quite poor. The newer version seems quite nice for the price. Jane Cosmetics - I was sent a few products from Jane Cosmetics (available at Ulta, ulta.com) and the quality is among the best ones found at the drugstores. The eye shadows, liners and the lip gloss in particular are my favorites. The color payoff is amazing and the shadow especially is super, duper smooth. The creme shadow makes for a beautiful base and does not budge once it sets. The bronzer is quite shimmery, but works as a nice highlight on medium/dark skin tones. Jane is brand I'll definitely check out next time I'm over at Ulta! Dr. Sponge Original and Green Tea Sponges for Face & Body - Dr. Sponge is a new brand to me - they make affordable, Konjac sponges for face & body. I tried the Original Sponge ($11.50; drsponge.com) on my Body and the Green Tea Sponge on my face. They are quite exfoliating and can be used with or without cleanser. My only problem with these are that they do not dry quite as fast as I'd like them to and as paranoid as I am with wet sponges, it makes me question the hygiene part of it. The Green Tea Sponge ($8.50; drsponge.com) is fast drying, compared to the Original Sponge though. They are definitely a budget friendly option and do the job well, but if I found a better way to get them to dry faster, I would use them much more regularly. Lulah Body & Hand Lotion - Lulah is a brand that makes some budget friendly bath and body products. Lulah is owned by Thymes and their fragrances are quite nice and the products are paraben-free. The Vanilla Orchid Hand Lotion ($9; lulah.com) is nice & light for the day, with a soft, sweet scent. The Peony Body Lotion ($13.35; lulah.com) is nice for light hydration too, but I'm not too fond of the scent. Its a tad too much for me and lingers for a really long time. If you are sensitive to such powdery, extremely strong floral scents, this is something to keep in mind. The lotion as such is nice, maybe a little light for dry skin, but good enough for normal skin and/or for when the weather isn't so dry. Have you tried any of these budget beauty picks?